Insurance is the least understood aspect of Blackjack with plenty of novice punters using the side bet without fully understanding its purpose. There are many professional players who suggest to never use the Insurance bet as you do lose money over time and there are others who believe it does serve a good purpose in the game if you are card counting and are able to predict the outcome of the hand. Blackjack players use the Insurance bet when the dealer has an Ace as a face up card and could have a blackjack. 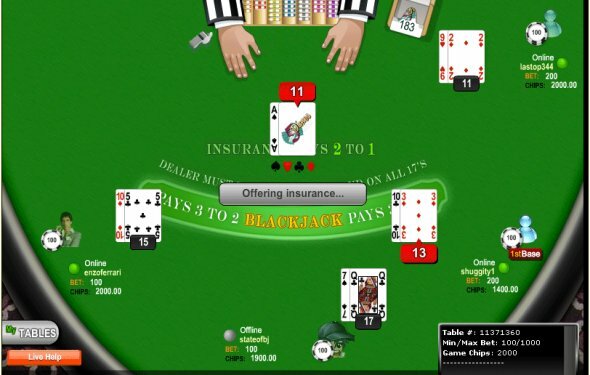 The player can choose to either use or ignore the Insurance bet. To accept an Insurance bet, the player places a separate second wager on the hand, equal to half of their initial bet. The dealer will then check their face down card and if it is a 10, Jack, Queen or King the dealer has a blackjack and the Insurance bet pays the player 2-1 odds. If the second card is not a 10-value card, the dealer leaves it face down and collects the player's losing insurance bet. Essentially, what you are winning with the Insurance bet is your initial bet back and risking half of that original bet. Winning on insurance balances out the losses on most hands however in the long run it is considered unfavourable as the odds do not match the payout amount. In a single deck game, there are 16 ten-valued cards and if you were not to see any other cards apart from the dealer's Ace, the 10-value cards compose 16 of 51 cards. Statistically in each suit, there are only 9 cards which do not make Blackjack for a dealer and 4 cards which do. Therefore the casino is paying out 8:4 (2:1) on a game which should be worth 9:4 and consequently the player will lose money over time.